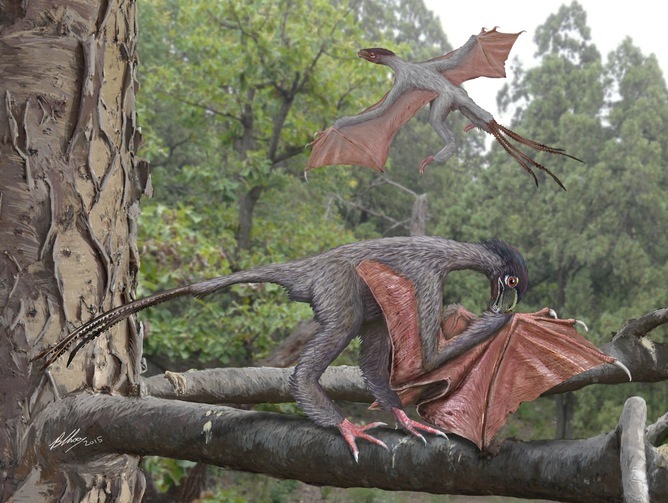 Artist’s impression of the new dinosaur Yi qi. 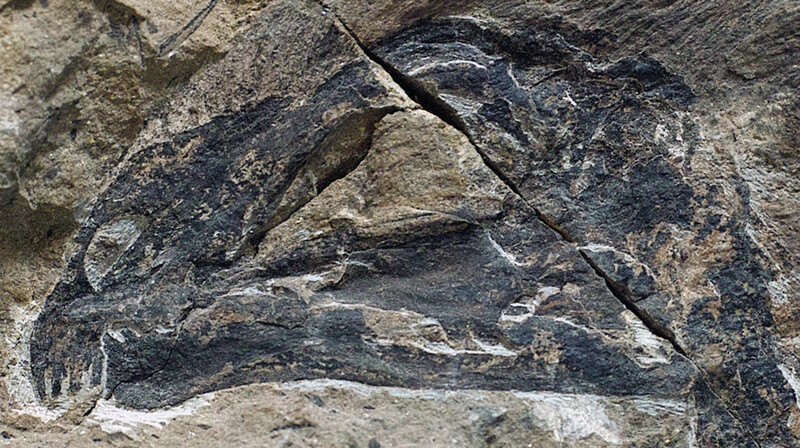 When it comes to big fossil finds, China is full of surprises. 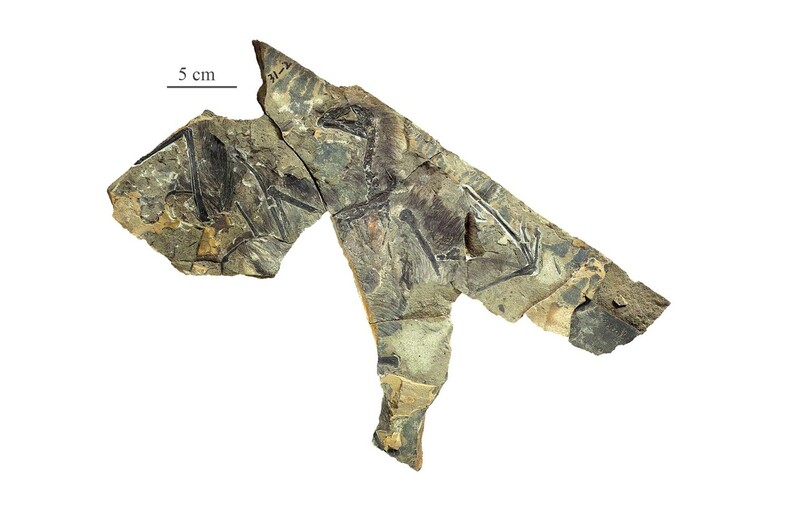 The latest dinosaur discovery, announced today in Nature, is a bizarre chicken-sized animal with a delightfully short scientific name, Yi qi, Mandarin for “strange wing” (pronounced “yee chee”). 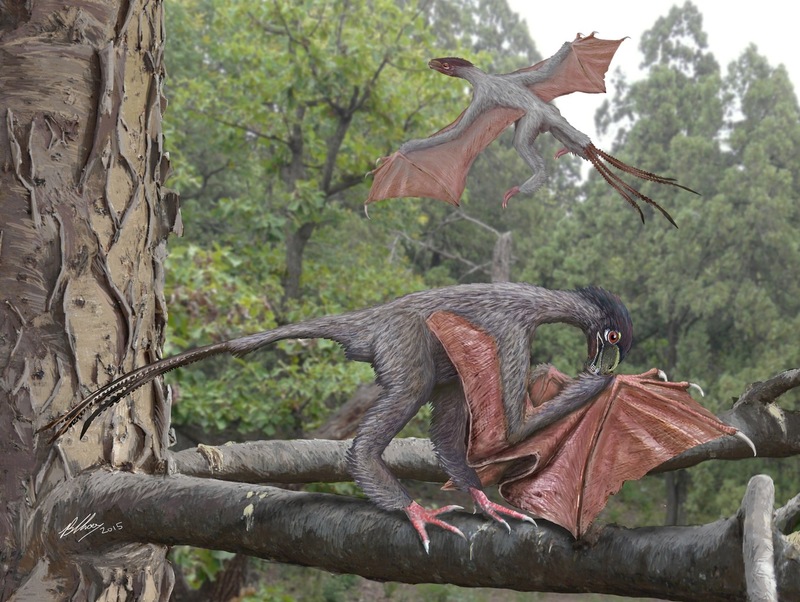 Yi is a new type of scansoriopterygid, a family of small feathered dinosaurs with unusually long fingers, including forms like Epidexipteryx. The extensively feathered fossil of Yi hails from the Middle-Late Jurassic (160-165 million years old) of Hebei Province, in northern China. It preserves a rod-like prop extending from the wrist along with patches of bare, featherless tissue around the hands. The most likely explanation is that the digits and bony rod supported membranous wing like in modern bats or mythical dragons. It is unclear if Yi was capable of powered flight or simply glided. I [and others] were suspicious that it wasn’t really part of the animal, but instead maybe a plant branch or other object that coincidentally was right under the wrist. But chemical analysis of it shows it really is derived from bone. 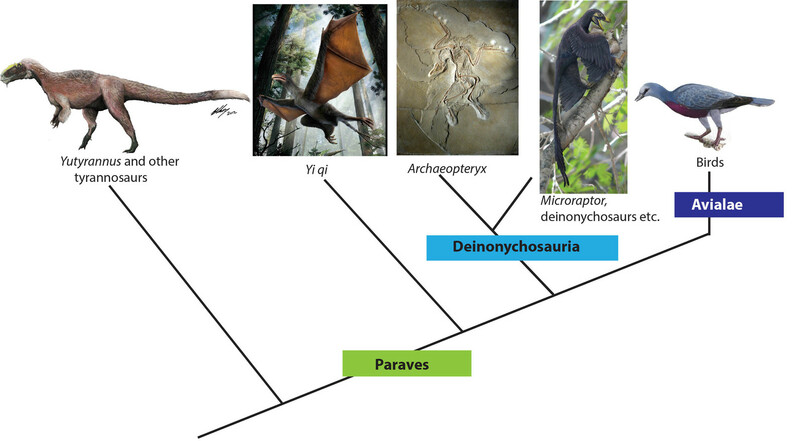 […] in case anyone thinks otherwise, this [discovery] has zero to do with the origin of pterosaurs! The first feathered dinosaur known to science was the famous Archaeopteryx, described in 1861 from the Jurassic of Germany although for over a century it was, by convention, called a bird simply because it had feathers. This view was challenged by the discovery of feathered dinosaurs from Liaoning, China, beginning in 1996 with the announcement of Sinosauropteryx from the Early Cretaceous, about 125 million years old. Numerous fossils from China, Canada, Germany and Russia prove that many groups of dinosaurs sported feathers or feather-like structures. These ranged from simple hair-like filaments to the complex pennaceous true feathers of modern birds, the latter used primarily for flight. We found out about this new dinosaur when were both visiting the Institute of Vertebrate Palaeontology and Palaeoanthropology (IVPP) in Beijing. We paid a courtesy call to our colleague Professor Xu Xing. This is the most unexpected discovery I have ever made, even though I have found a few really bizarre dinosaurs in my career. I know the complexity of the dino-bird transition but this new find shocks me. It demonstrates some of the extreme early experimentation as dinosaurs began to take to the air. Yi illustrates that the transition from dinosaur to bird wasn’t as straight forward as previously thought. A great deal of innovation took place in animals close to the origin of birds, ranging from the membranous wings of Yi to the four feathery wings of Microraptor. Flight evolved multiple times within the dinosaurs. The configuration in modern birds, with a single pair of feathered wings, would ultimately prove to be the winning formula. The fossil of Yi is part of an extraordinary assemblage called the Daohugou Biota from Hebei, Liaoning and Inner Mongolia. These Jurassic sites display the same superb preservation as the better-known Early Cretaceous Jehol Biota of Liaoning Province. Both these assemblages have produced the vast majority of feathered dinosaur and early bird specimens. One objection against the dinosaurian origin of birds was the supposed absence of feathered dinosaurs in rocks older than Archaeopteryx (the 150 million year old “first bird”). The Daohugou removes this paradox, revealing a community of feathered creatures that lived over 10 million years before Archaeopteryx. 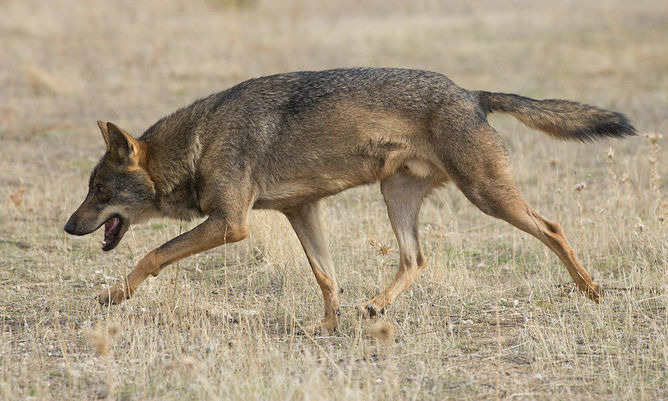 One of the most exciting things about this animal is the way it seems to have independently hit on a type of flight apparatus, consisting of an aerodynamic membrane supported partly by a rod of bone or cartilage, that is also seen in pterosaurs, bats and many gliding mammals. In that respect Yi really showcases the power of evolutionary convergence. Convergence appears repeatedly in evolution when functional constraints produce similar body forms in unrelated lineages. 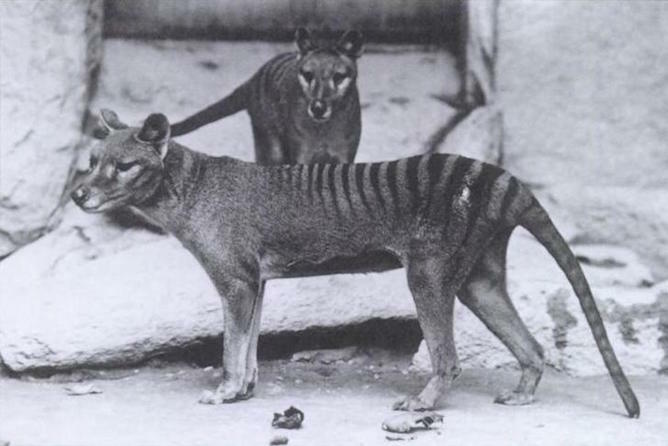 It explains why marsupial thylacines and placental wolves and dogs look alike although they evolved independently over tens of millions of years on different continents. The unexpected discovery of Yi once again highlights the stunning diversity of fossils that have been unearthed in China. From the oldest well-preserved enigmatic jawed fishes like Entelognathus to the world’s most complete series of feathered dinosaurs, early mammals and first birds, Chinese palaeontology is full of unique treasures. Dinosaurs are no longer the scaly beasts you imagined them to be as a child. How did these enormous creatures get into the air?